@ 18mm, f 13, 1/60s. Q1. 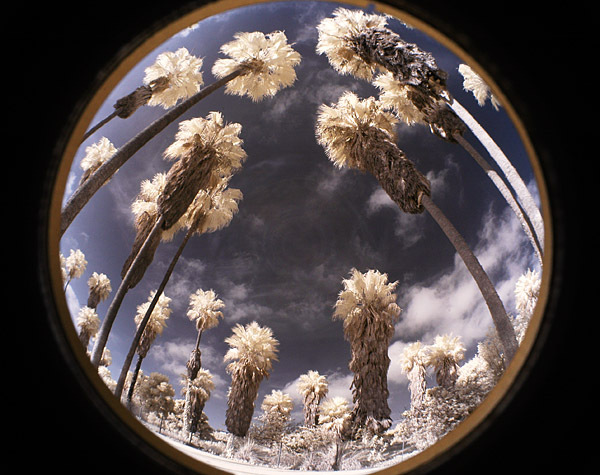 Can I use any regular lenses on your infrared-converted cameras? A1. Yes! All the cameras I converted behave exactly the same as original camera. You will not notice any difference from outside. Since you do NOT need an external infrared filter, you will also get the same bright viewfinder. Please be careful since you will not see the infrared flare, but it might show up in your images. I know the Canon Kit lens, EFs 18-55mm may show some flare under certain conditions, while all other Canon and Nikon lens work great. Maybe because I did not buy a lens hood for my el cheapo EFs 18-55mm. A quick glance at the LCD will confirm if you have got the images you like! Q2. How about the focus and metering of your converted digital cameras? A2. The auto-focus is generally pretty good on the infrared. What you see is what you get, just point and shoot. Metering also works fine. Sometime, it need some adjustment, because diferent scenes have different amount of infrared light in it. For example, the foliages are as bright as snow in infrared photography, so we need to reduce the exposure a little to prevent the "washed out" hightlight. For the rocks, I found sometime, I need to overexpose to about 1 stop. Q3. 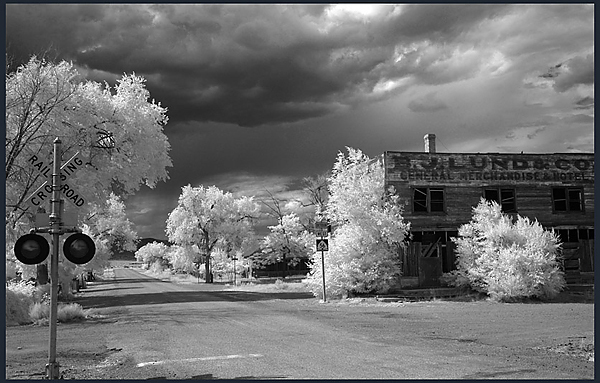 What is the typical shutter speed your infrared cameras need? I know the infrared film and the unconverted digital camera need a tripod and may need many seconds. A3. My infrared digital cameras have sensitivities similar to before they are converted. Actually, I rely on the camera recommended shutter speed, which is the same as I used a ordinary digital camera. I usually use aperture priority, may adjust the expoursure (within 1 or 2 stop), the same as I do in color photography. So basicly, the shutter speed are similar to the convensional cameras. I once even take infrared photos of the animals in the zoo hand hold. Q4. What about white balance? A4. I usually use custom white balance with the foliages. (So the foliages are white!) I will preset the camera, and will also be happy to help with the white balance. Please see Q9 for details. Q5. What do you exactly do with the cameras, and what is the quality of your job? A5. I take out the original UV-infrared blocking filter from the cameras and install my custom-made infrared filter at the same place. And thoroughly clean and test the camera. I take great patience to make sure everything is as good as it can gets. If you are not happy with the cameras from me, you can return it to me within one week after you receive it for full refund. Please email me first, so that I can make sure I get the return and refund you in time. Or, if you prefer, we can transact in eBay, which takes a little more time but we have a excellent mutual feedback system. Q6. What kind of infrared filter do you use for the conversion? A6. I use a custom-made filter, with a cutoff around 720nm, similar to Hoya R72. I have compared several different filters by spectraphotometer and actual photo testing, and found this type of filter gave the best images. Q7. Can you do conversion for us? A7. I am currently taking a break and doing some traveling and photography. I will not be able to do conversion for a while. Yeah, life takes changes. I will update here when I start again! I will try to answer your questions, technical or artistic, when I get internet connection. Please shoot me an email at jimchen2005@hotmail.com. Q8. Why are you doing this? How does your work compare to other comercial services? A8. I am doing it for the joy of photography! As a scientist myself, I am well aware of the technology optimization through relentless experiments and lab testings. As an amature photographer myself, I am also very eager to take my camera as an artistic tool into the real world--no mater it is in the snow or desert. I have tried numerous filters, and I know which filter makes my images look best. And I put that one in that camera. If for any reason, you do not like my camera, you will get your money back! Q9. What happened if my IR images look too red? How to set the white balance? A9 If you use the auto or any white balance except a preset, it will look too red. If your camera suddenly gives red images, the shooting mode might acidentally changed to some auto mode, which choose auto WB. Since the grass and foliage are very bright in IR, I usually use them to pre-set white balance. For Nikon:(1) Select the WB to "pre", (2) set the exposure compensation to -2, (3) press and hold the WB button until the "pre" letter flashes in the top LCD, (4) point the lens at a patch green grass or tree leaves under bright sunshine, try to fill the full frame, and take a shot. Normally, the camera will be sucessful, and the "good" letter will flash in the top LCD. If it says "no good", then you might need to adjust the exposure level a little, or point to another patch of glass. (5) set the compensation to normal, and done! For Canon: With the memory card in the camera, take a IR image of a patch of green grass or tree leaves at reduced exposure, and use that as WB photo. You may take an IR images of a patch of grass at reduced exposure, save it for the "rainy" days (If you want to change the pre-set WB often and later on, you want to revert to your original WB, you can use that image to set the WB.). Q10 Can I get very pure IR images out of the modified camera? I want to cut off the visible light very agressively! A10 Yes! The internal filter I put into the camera passes the light with a wavelength longer than 720 nm, which is similar to R72, 89B, RG695. It will gives you a little color, which you can change to black and white, or do the channel swapping to give you blue sky. If you really want pure IR, like 87, you can just put a external 87 IR filter on the lens just before you take the exposure (after you use the camera to do the auto focus and metering). You do not need to buy the super expensive 87 filter. I found we can use the cheap square Lee polyester filter (4' by 4' for $24, Lee Mfr # 87CP, B&H # LE87C44). Now it is "double-filtered"! It works great, completely remove all color! Q11 Can you remove the IR blocking filter and put a plain glass into the camera, so that I can use the camera for IR and color? A11 Yes! If you have a plain glass inside of the camera and put a IR filter on the lens, you get great IR images and very sensitive! But you need some sort of filter on the lens to remove the IR if you want to shoot color. Otherwise, it will give reddish color, which may need correction in WB or photo editing. The internal plain glass filter is great for the astro-photography. The hydrogen alpha line will not be blocked (similar to the now discontinued 20Da). Q12 How about IR flash, I want to take photos of the rabits in my backyard after dark?! A12 Yes! You can just put a piece of Lee polyester IR filter on the flash, and you get an IR flash! It will only give very small amount of visible flash, so it is not very disturbing. You can also cover the flash with a piece of unexposed but developed color transparency film. I used the end of a developed velvia 120 film. Or, you can get an LED IR light (usualy they sell for light vision, or camcorder), as the light source in the dark. I bought a bag of IR LED from eBay for very cheap! Now you can take IR photo day and night! :) Please note that now you might need to manually adjust the exposure and/or focus. Please do not use the IR flash continuously--the IR filter on the flash may get hot. More Q/A coming soon! If you have questions, please send me an email so that I can add to the FAQ.